You’ve probably been in this situation before: a stop-and-go backlog at an exit ramp (like the Brooklyn Bridge exit off the FDR Drive) where you wait patiently in line. 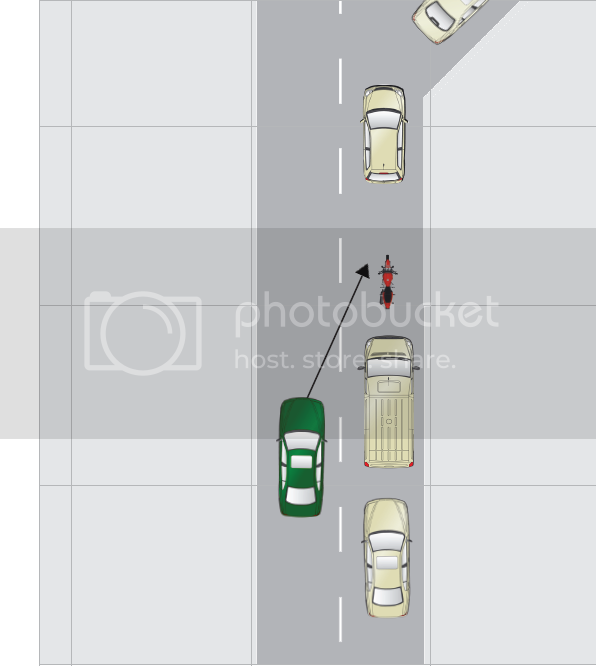 The driver in the green sedan is a line-cutter, or an out-of-towner, or an inconsiderate jerk, and he’s going to jump in line right before the exit ramp. Especially if a large vehicle is nuzzled right up to your rear, you might be completely invisible until the last second. but further from impact, and possibly closer to an emergency exit if your right-of-way is violated. Always have an exit route planned to ditch out into another (clear) lane, shoulder, or ramp. Be aware of those behind you (even in other lanes) while you’re “just” waiting. Even if traffic is moving well, it’s always a good idea to do a head-check over your left shoulder for those who might try to jump in front of you at an exit ramp. As a two-wheeler you’re entitled to the full use of your lane. It’s to your advantage to think about lane position as a strategy to staying safe. Have other urban riding tips? Let us know. Temperature in the Northeast is hovering around freezing. Is it a perfect time to go riding? Most riders pack it up as soon as the weather starts getting cold. It’s understandable – for many, motorcycling is primarily a social activity, and who wants to hang out outside with friends in the freezing cold? 1. The roads are all yours. Few other riders out, means that your favorite roads will be empty of traffic. 2. Fewer Entanglements. Few other riders also means you will not be subject to the summer tradition of harassing roadside checkpoints conducted by the police. 3. Keep your skills sharpened! Riding through the winter means that when spring comes, you are at the top of your game. In fact, because your skills are so sharp, you will even more keenly be aware how dulled every other rider has become, once spring does bloom. 1. Today’s rain can become tomorrow’s black ice. If temperatures overnight dip below 32F, any water on the ground will be ice in the morning. This includes splashed-out puddles, drips from overpasses, and road defects. Expect ice anywhere and everywhere. 2. Cold tires can be slippery. Not only MotoGP racers are subject to lower traction from cold tires. In cold temperatures, you should be a bit easier on the gas and brakes for the first 20-30 minutes of your ride. 3. Clean that salt off! If your bike gets covered in salt from the road, try to wash it off before too much time has passed. Apply chain lube more frequently in winter to keep grit away. 4. Heated gear is a marvel. Buy yourself a heated jacket liner and heated gloves. There is no reason you can’t be warm as toast, even in February. You’ll wonder why you didn’t sooner. Nobody gets to choose when they crash. The rider in this picture knows that. So why would he allow his passenger to be in such a risky situation? Passengers are subject to the same risks as the rider. Hitting the road at 30 mph feels exactly the same if you’re holding the handlebars or not. Riding a motorcycle (especially in the warm weather) as a rider or passenger can be an enormous joy – but why unabashedly expose your friend, sibling or even your spouse to risk with no useful protection? Riders: Don’t give your passenger a novelty helmet, especially if you know enough to have a proper full-face helmet for yourself. The word on the street is, they’ll appreciate your concern about their safety. Respect your passenger and enjoy the ride together!